Red Beans, Black Friday, Golden Scones too! Well, another week has slipped by….where does the time go? It’s been a productive week though, so I’m feeling good about a bit of ‘chill time’ today…catching up with my fav. blogs and writing a new post. As I mentioned a while back, I am now working on two new cookbooks. 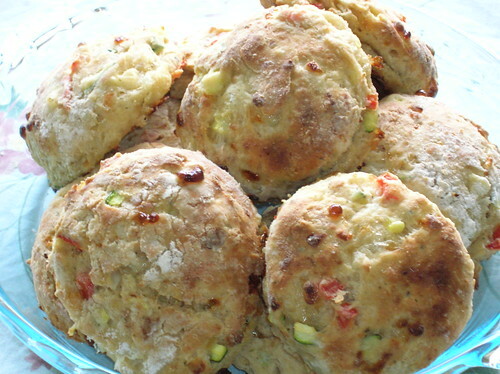 The Veggie Pizza Scones featured below are one of my new recipes for the revised edition of NJFV. If I do say so myself, the photo is pretty darn nice don’t ya think? A great scone to accompany soup or chili. I’ll include the recipe for these scones at the end of this post. 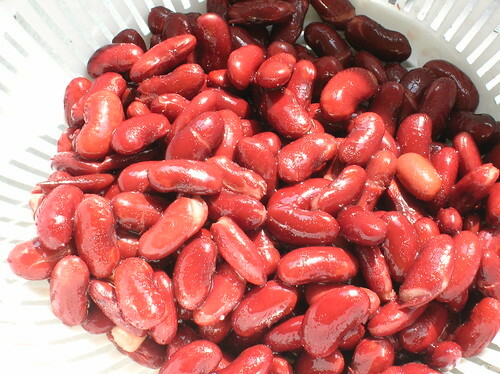 Still on the topic of food and recipes, I continue to find more and more articles about the nutritional value of beans, in particular red (preferably dried not canned and if possible organic) beans, for retaining the best nutritional value and flavor . And here’s a couple of ways to use beans in recipes. Yesterday was Black Friday (that can sure be taken two ways!) and also No Shop Day/Buy Nothing Day, how’s that for an oxymoron? So what did you all do to celebrate the day? Shopped till you dropped or refrained from pulling out your wallet for 24 whole hours? We didn’t buy much yesterday, only a few items at our local food co-op, so I guess that’s pretty good! I am happy to see that there is a gradual (albeit very gradual) shift in consumer’s buying patterns and the No Shop Day really brings to mind just how much we buy and consume on a daily basis and really, is it all necessary or worthwhile? The impact and implications are indeed food for thought and on a number of levels: environmentally, socially, ethically…. One of the things that is emphasised on the No Shop Day articles and sites I’ve checked out is the rising awareness of just how and by whom so many (especially cheaper) consumer goods are being manufactured. Is there any joy in buying some item that was made in a modern-day ‘sweat shop’ even worse, with children being the source for cheap labour. Yes, it’s still happening. The good news: Consumers can and do have a huge impact on the retailers and the trends. Demanding accountability and integrity in the retail sector should be a given. I really am encouraged to see the interest and impact that No Shop Day is having, around the world. One last note on the subject. I also think that a huge part of overspending and over-consumption comes from the credit card madness that so many people eventually find themselves facing. What would the world be like now, without credit and especially as accessible as it’s become? In Canada and the U.S., credit card debt is now at staggering, unbelievable proportions. Not good for anyone, is it? Joe and I have made a sincere commitment to buy with cash, save for what we want/need and not allow ourselves to get overwhelmed with debts in the future. It’s a good feeling. OK, I’m getting off my soap-box now, enough said. Ohh…maybe not, can I say one more thing on the subject LOL …..
As you can see from this photo…nap-time is getting friendlier!!! Note body-part contact and all is well…LOL Hope it keeps up. In blogging news, isn’t it fun to check out what posts get the most clicks? I had a lot of traffic to my Cookies and a Thanksgiving Wish post, this past week in particular. 364 clicks since I originally wrote/posted this one in October!!! Hope the cookie recipe and my thanksgiving wishes were well received. Another very popular post is my one about exercise guru, Ed Allen. People stop by that one on a daily basis and this post on Google is at the Number 1 spot for the search term Ed Allen. I guess I wasn’t the only person wondering, Whatever Happened to Ed Allen? Here’s the Pizza Scone Recipe. Do let me know if you give them a try! A hearty, colorful and satisfying scone, great with soup or chili. Lightly grease a large baking/cookie sheet and set aside. In a medium-sized bowl, combine the first 4 dry ingredients, cut in butter/margarine until crumbly. Add beaten eggs to the first mixture, stirring just enough to combine. In a small skillet, heat olive oil over medium heat. Saute remaining ingredients (except for cheeses and pesto) until slightly softened, about 2 minutes. Remove from heat, cool mixture, then add pesto and cheeses. Add veggie mixture to the dough, stirring (or use your hands) just enough to combine. Dough should be soft but not sticky. Add a bit more flour if necessary. Form a ball of dough and allow dough to rest on floured board for 10 minutes.Preheat oven to 400F. Knead dough slightly (1-2 minutes). Gently roll or pat out dough to a ½ “ thickness and cut in 10 rounds (a floured, standard-sized coffee mug works well as a cutter). Place rounds on baking sheet and bake 12-15 minutes or until golden brown on top. Reduce heat slightly if over-browning. Wonderful fresh from the oven or if reheated, split in half and toast. Veggie Pizza Scone Recipe: Geraldine Hartman 2007. All rights reserved. I keep saying that I’m going to make scones…but haven’t gotten around to it! Pizza scones might just make me want to get going on that, though! No Black Friday shopping for me. Too much craziness out there! I’ll wait until things setttle down a bit. I’ve already gotten quite a bit of the holiday shopping done, truth be told. I put it off last year and didn’t wwant to get stuck again on Christmas Eve! Yikes!!! The pizza scones look delilcious. Love the color and texture. I bet they are delicious! What mostly keeps me away though, is the crowds. Do not function well in certain types of crowds. Great looking recipe, and yes, the photo is outstanding! I passed on “black friday” too, no thanks. I hate shopping under normal circumstances, much less pre-holiday madness. You are SO right about the credit problems esp. here in the US…I personally think it is part of gov’t/financial sector conspiracy to keep poor and middle-class people “quiet” by making them believe that they are wealthier than they really are. Who complains when they have $100 shoes, ipods, cell phones, Wiis, etc, all on credit. Plus it distracts people and keeps them ignorant about things that really matter, like war, poverty, homelessness, environmental disasters, what’s in their food, etc. 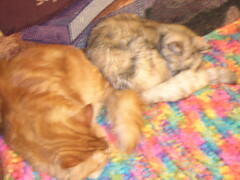 OK, enough of that charming rant….so glad to see the kitties are cozying up to each other. You’re lucky, they’re going to get along just fine! Your scones look delicious! Thanks for sharing the recipe! I’m thinking those two will be fast pals by the end of the winter…cold has a way of making warmth the all-encompassing friend-maker! Hi Sheep, Hope you give the pizza scones a try. Only downside here, we gobble them up way toooooo fast!!! Like these with chili a lot! Hi Cynthia, Thanks for your thoughtful comment. Stashes…wow, don’t get me started. I guess my worst impulse buy is still books (could be worse things, right!!) we’ve got enough to start a library. Someday, they probably will end up there so I guess thats a positive thought. Thanks for your compliments re: scones. Hi Caroline, Glad you enjoyed the post. You aren’t ranting…it’s just the way things are. Too much spending and consuming isn’t good for anyone. It just takes thinking about it (or being forced to with debt) to realise that. I’m glad a lot of people are. HI Beth, Thanks for the compliment, hope you give them a try. Hi Barry, Thanks for stopping by. You have a very interesting blog, do take a look readers, Barry writes on debt problems and solutions in a very real and personal way. Good stuff. Ill be stopping by again soon. Hope you all have a great week, thanks for your comments. Your first book was so awesome, I can’t wait to see what you’ve cooked up for your next ones. 🙂 Happy holidays Geraldine! Glad to see the kitties getting along better, too. I don’t buy into the “black Firday” hype any more…I stay home the entire weekend. People are just too insane both in the stores and on the roads. Be wary eating vegetables out of cans. I posted an ABC news story about plastics, and one of the bad chemicals they report on is used in the plastic lining you see in cans of vegetables. I put the url in; I think that if you click my name it will take you to that story. Those scones look so delicious. Good for you with the two new books on the horizon. Hi Michelle, I agree with C’s comments too. I’ve had quite a few emails about No Buy/Black Friday observance. This has struck a chord with a lot of people. Hi MaryAnne, The scones are delish, I just made some yesterday.